Jose Fernandez has been a beacon of hope for the hapless Marlins. SuiteSports would like to welcome new contributor Bennett Corcoran. Bennett is the ace of our baseball staff (haha, see what we did there?) and makes his SuiteSports debut by bringing you a rising star for every Major League club. We begin today with the National League. -Ed. With baseball season finally underway, fans, players, and analysts alike are all looking toward the future. Which teams will continue to play well? Which teams will continue to struggle? Which teams will turn it around in the remaining 140 games or so? With so many questions looming about this season, I thought I would focus on players that could not only impact their respective team’s fortunes for this season, but potentially for plenty more to come. While we are all so captivated by what will happen, let’s take a look at which up-and-coming players could have an impact down the road. We begin today with the most promising young players in the National League, with the American League's future stars coming tomorrow. The young lefty has dominated in his first three starts this season, posting an impressive 1.42 ERA to go along with a 1.05 WHIP and .197 BAA. While expecting the twenty-three year old to continue this type of output throughout a full-length season is clearly unreasonable, Corbin will provide stability in the Diamondbacks' rotation, and should only get better with time. After showing glimpses of promise in his 17 starts last year, Corbin has started off the season on a tear, and looks to team with Tyler Skaggs to form a formidable lefty tandem for years to come. Another young lefty with plenty of potential, Minor is outperforming expectations on the league’s top team. He has posted some gaudy numbers so far, including a 1.80 ERA and a 0.92 WHIP. While the other highly touted pitcher in Atlanta’s staff, Julio Teheran, has struggled mightily, Minor has thrived. As the Braves prepare for an October run, Minor could prove to be a very integral part of the team’s dynamic. Along with shortstop Starlin Castro, Rizzo appears to be one of the building blocks the Cubs have in place for plenty of years to come. Despite Rizzo’s cold start to the season, he is still hitting for power (6 home runs) to counteract his poor average of .188. Based on his production last year after getting the call, it is safe to assume that his batting average will bounce back and that Rizzo will continue to improve. Perhaps by the end of the season, Billy Hamilton could emerge as Cincinnati’s rising star. But for now, it’s difficult to ignore Bailey, who has started off the season by posting a 3.24 ERA and 1.16 WHIP. Bailey seems to have plenty of momentum, even dating back to last season’s no hitter, and I would expect him to continue to improve as the Reds attempt to stay atop the NL Central. Another catcher starting the season on a hot streak, Rosario has performed admirably on the most surprising team in baseball through the first month of the season. The young catcher is hitting .298 and provides another offensive weapon to team with Troy Tulowitzki, Carlos Gonzalez, and Dexter Fowler, forming one of the best offenses in the league right now. I also had to include Chacin simply because the Rockies rotation has gone from a horrendous four-man disaster last year to a middle-of-the-pack rotation, which has made all the difference so far. Chacin has been a big reason why, currently with a 3-0 record to go with a 1.46 ERA and 0.89 WHIP. The 26 year-old rookie from South Korea has looked like a quality addition for the big spending Dodgers. While his 4.01 ERA isn’t spectacular, his 26-5 strikeout-to-walk ratio is promising. With Zach Grienke out with a broken collarbone after his brawl with Carlos Quentin and the San Diego Padres, look for Ryu to provide consistency for the rotation in his absence. Many around baseball view the Marlins as Giancarlo Stanton and a collection of replacement-level nobodies after the blockbuster deal with Toronto shipped almost every recognizable face in Miami north of the border. 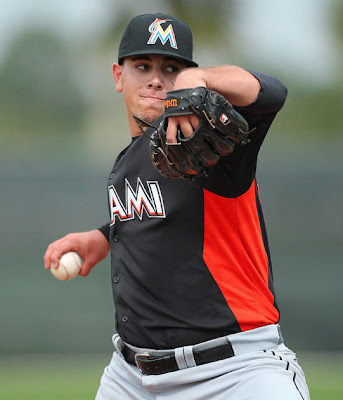 However, Fernandez has established himself as a notable exception. While his last two starts were much less promising than his first two, the 20 year-old has plenty of room to grow. The main piece of the Zach Grienke deal at the trade deadline last year, Segura has prospered in a full-time role with the Brewers. Currently fifth in the NL in batting average at .359, Segura is powering Milwaukee’s offense as he attempts to lead the Brew-Crew to the postseason along with Ryan Braun. A capable fielder, Segura is already making the Angels regret that trade, as they currently have nothing to hang their hats on from this deal because Greinke bolted across town to the Dodgers this winter. Second in the NL in ERA (0.93) and first in wins (4), Harvey has given the Mets a dependable ace. The twenty-four year old is also posting a 0.66 ERA and looks to team with Zach Wheeler in the future to form an intimidating one-two punch for the Mets. Showing flashes of brilliance last season as well, Harvey has solidified himself as the real deal. Despite his underwhelming bat, Revere has all the tools to be an everyday player. His speed and quickness allow him to be a great defensive centerfielder, and he has already impressed this season with some remarkable web gems. Already leading his team in steals, Revere looks like he could be a dependable option at the top of the order for the Phillies as they look to bounce back from last season’s disappointing performance. The twenty-four year old Marte is already hitting .329 to start the season and looks to lead Pittsburgh to a winning season. While he can be a strikeout machine at times, Marte makes enough contact to hit in the middle of the order with Andrew McCutchen. His power numbers also aren’t overwhelming, but Marte has plenty of potential and can help turn a woeful franchise in the right direction. The Padres have a nice collection of infielders including Chase Headley and Yonder Alonso, and Gyorko is a solid addition. Capable of playing both second and third base, Gyorko has the versatility to be an everyday infielder in San Diego. While his bat hasn’t burst onto the scene yet, he should develop into a confident hitter with time. Although the young studs for the reigning World Series champions are clearly Buster Posey and Madison Bumgarner, I thought Crawford also deserved some recognition. His sleek glove provides excellent defense at short, and his improving bat is another plus for the twenty-six year old. Hitting .303 right now, Crawford is certainly exceeding expectations at the plate, and if he continues to perform at this level, the Giants could solidify this team as a dynasty. The Cardinals have one of the best prospects in the game in Oscar Taveras, but for now Miller is the reigning young star in the St. Louis dugout. Sporting a 2.16 ERA with a 0.88 WHIP and .169 BAA, the twenty-two year old has burst onto the scene this April. After some nice contributions last season as the Cardinals pressed forward into the postseason, Miller has helped alleviate the losses of Chris Carpenter and Kyle Lohse by providing plenty of hope for St. Louis. The Nationals have plenty of young talent between ace Stephen Strasburg and outfielder Bryce Harper, but the list certainly doesn’t stop there. Although second baseman Danny Espinosa is struggling to start the season, he did provide a reliable option at second base and could shift to shortstop if necessary. Despite his injury history, Ramos is a serviceable option behind the plate, and if the twenty-five year old can stay healthy, the Nationals can certainly contend for a World Series title.